Changes are also reflected in the commandant's office staff and the security group, winch temporarily consisted of four companies of the SS Death's Head Units of three combined companies, called a 'Sturmbann'. 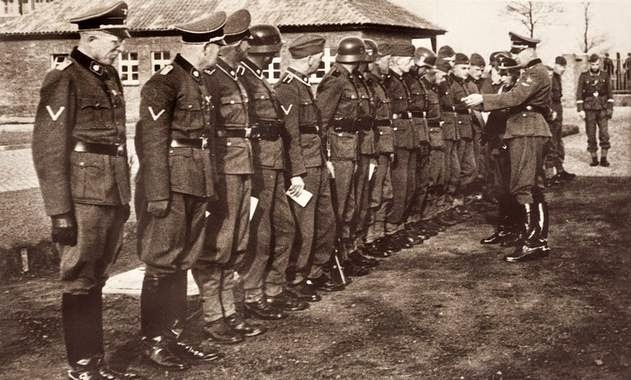 Younger members of the SS were sent to the front and replaced by older or wounded soldiers, that had only limited service suitability for the Waffen-SS. Although SS guard troops were in the first place exclusively still used at sub-camps, but the SS building brigades used in the clean-up of bombed cities had been from the fall of 1942 guarded by police organizations which were enlisted in part from municipal staff. The Neuengamme SS in 1944 took over nearly 1,000 soldiers from the Wehrmacht. They received new pay-books (Soldbücher) and special uniforms. In addition, as police were withdrawn, civilians who were mostly drawn from the public administration and used as a Reserve. These included customs officers to reinforce the guard units. At the sub-camps where prisoners were forced to work for construction projects for the Wehrmacht, units of the Navy and the Air Force took over the guard duties. In the Women's sub-camps male staff was generally used only for external security, while in the camp for the monitoring of prisoners female SS guards (Aufseherinnen) were responsible. Overall, the number of guards rose in total for the area of the Neuengamme concentration camp from a few hundred in 1940 to 4,000 - 5.000 by 1945, of which only half were members of the SS. According to the report of the SS-station doctor dated 29 March 1945 the average strength of the SS troops, including headquarters staff in the first quarter were 2,211 members of the SS. Of these 1,592 were on guard duty in the Main Camp (Stammlager). In the women's sub-camps a further 444 Auseherinnen were used. In addition, not SS associated forces were drafted for guarding an increase of 2,072 prisoners. These figures required the necessity in higher personnel expenses for the sub-camps. While in the main camp nearly 600 members of the SS guarded 12.000 to 14.000 prisoners, of them, over 100 members of the SS were part of the Administration including other departments, while in the sub-camps with more than 40,000 inmates, another 4,100 armed personnel had been used for security purposes. View of the SS compound. The large doors of the SS garages, which still exist today, are visible in the background on the right. In addition to the guards there were six departments within the SS camp: first, the Commander, 2nd, the Political Department, 3rd, the Detention Camp (Schutzhaftlager), however, from 1942 the 'Arbeitseinsatz' (Work Assignment) managed as a separate department. 4th, Administration and Management, 5th, Department of Medicine, and 6th, Training. At the behest of the camp commander Pauly the Office of the Interpolation Points (Stützpunkte) [this is something like a Support Unit,sic] had been created in 1944 to better manage the sub-camps. In March 1945, there were eight Points, which controlled almost all other camps at different locations. The object of the base manager was passing on the death reports of all subordinated stations. By this structural change the base manager (Stützpunktleiter) formed an intermediary between the camp commander and the individual commando leader. They were responsible for all organizational matters, handling of postal traffic and disclosure of changes of death reports, and regular monitoring of individual outer laying camps. Until recent, right towards the end of the war, including the main camp was expanded. For the Rifle Production of the Metal Factory Walther, a hammer mill was built in 1944/45, which was, however, not put into operation, the construction was not completed by April 1945. Yet during 1944 structures of two large double-storied accommodation buildings were built of clinker bricks that were occupied by a total of eight prisoner blocks. Originally, the expansion plans were much more comprehensive. The Official Group C (Construction) of the SS-WVHA intended in 1942/43 an extension of the Neuengamme concentration camp, which was aimed at an average occupancy of about 15,000 inmates. In detail it was planned: the creation of further administration buildings and factories, a two-storey building with entrance gates including an exit openings on the opposite side as a thoroughfare, a delousing station, a crematory, prison cells of different sizes, and a lot more. The extensive wooden barracks and the simple wooden huts built in 1940-41 foresaw the replacing by eight large massive construction of two-storey accommodation buildings. The plans indicate that the SS after a victorious conclusion of the war saw a great need for concentration camp inmates, and intended to expand Neuengamme on long term basis. Nothing should be any more provisionally, everything should be done in mass construction. Entrance to the prisoners’ compound. 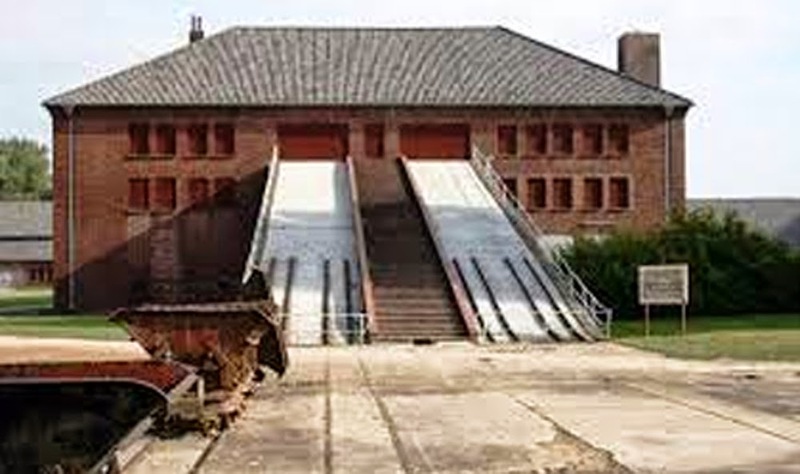 On the left and right are the wooden barracks for the commanding officer of the prisoners’ compound (Schutzhaftlagerführer) and the reporting officer (Rapportführer). In the background, the roll call square and the kitchen barracks can be seen. The living and working conditions in the main camp and sub-camps deteriorated rapidly towards the end of the war. [This was a general trend right through Germany,sic.] Overcrowding, inadequate nutrition, insufficient medical care and catastrophic sanitary conditions led to the deaths of many prisoners. In some other locations, such as in the Friesenwall project, within a few months from the 1,700 to 2,100 prisoners in the anti-tank ditch construction, the monthly death rates were at the end of 1944 more than ten percent. Based on the total number of all prisoners of the concentration camp Neuengamme and the sub-camps the mortality rate, taken the incomplete information into account, the infirmary Books of the Dead in 1943, show an average of 332 deaths per month and rose by December 1944 to 2,675, which means a day on an average of 86 deaths. On the 28th of August 1944 Adolf Hitler ordered the construction of a fortification – the so called “Friesenwall” – after the Allies had invaded Normandy in June 1944. This wall was supposed to be drawn along the coast in two defence lines from the Netherlands to Denmark. Behind the coast line with firing ranges, fox holes and blocking positions trenches were to be dug in a second defence line. Aurich city was proclaimed a fortress and supposed to be additionally secured by antitank ditches.The antitank ditches were four to five metres wide at the surface and two to three metres deep. The sloping walls of the ditches run to half a metre wide bottoms. The Organisation Todt was in charge of the site management for the ditches. Mainly concentration camp prisoners from Neuengamme were deployed for this job since workers were lacking towards the end of the war. They prisoners could be placed in the hutment in Engerhafe which had been proclaimed a satellite camp of Neuengamme. Initially, the dead were still being placed by a Bergedorf funeral home to the local union crematorium at Ohlsdorf. As from 1942, the SS also had corpses cremated in a mobile incinerator of the Kori company in the immediate vicinity of the camp. In mid-1942 a first camp own crematorium was then completed. 1944 the SS Central Construction build a new crematorium, which was taken in December 1944 into operation. In addition to the prisoners who were ruined by work, other people found their death in the Neuengamme concentration camp. The camp served the state police station Hamburg as a central place of execution. Gestapo and SS took until 1945 approximately 1,400 persons for execution into the camp, they were shot at the shooting range near the sewage treatment plant or into the prison bunker, and hanged. Among them were a large number of Soviet and Polish forced labourers and of resistance fighters of different nationalities, mostly Dutch union representatives that had organized at the end of 1944 a railway strike. The bodies of the executed were often made available to the anatomical institutes of the University Hospital Hamburg-Eppendorf and Kiel. But even the Justice Department ordered temporarily death sentences to be performed in concentration camps, as their own execution site had been destroyed at the remand prison by a bombing raid in August 1943. Hamburg Courts arranged for at least 16 cases of the execution by firing squad in the concentration camp Neuengamme. Twice, instead of the usual executions, murders were committed in the concentration camp instead with poison gas. The victims were 197 wounded (invalids) Red Army soldiers and 251 Soviet officers or other persons covered by the Commissar Order, which had been selected by special command of the Hamburg Gestapo in the POW location XI B at Fallingbostel. These 448 people were gassed on 25 September1942 and at the end of November in which for this purpose separately sealed prison bunker, with Zyklon B. Shortly before the end of the war there was still about 50,000 prisoners in the hands of the Neuengamme camp administration. As to the camps with the nearby approaching front in the preceding months, the SS chose here the same way of camp closures and their clearance. On March 26th 1945, the evacuation of the two located sub-camps in the Emsland area, Meppen-Versen and Meppen-Dalum commenced the resolution of the Neuengamme Camp Complexes. Within four weeks, on the 1 April, the other locations of Neuengamme concentration camps were dissolved, just as quickly as the British and US troops were advancing from the Rhine to the Elbe. Also on the 1 April the sub-camp Porta Westfalica was cleared in the first week of April, as well as the sub-camps in Bremen, Hannover, Salzgitter and Braunschweig. In the following days until the middle of the month, prisoners were placed in the west or north from outdoor camps on uncoordinated marches. By mid-April 1945, the majority of the then existing 57 other locations of Neuengamme concentration camp were disbanded. The prisoners were led away on rail transports and on foot marches in front of the approaching Allied troops. With food, if ever provided, for a day or two, some transports were over a week on the road. Many prisoners died of thirst and starvation. On foot marches, the SS guards shot those who could not keep up. In parts those on foot wandered aimlessly around on by-roads until they finally reached a destination. Most transports led the prisoners into Collection Centres (Auffanglager), target of the 9,000 prisoners, especially most of them from Bremen and Hamburg including some other locations with sick detainees, such was the Prisoner of War Camp Sandbostel at Bremervörde. 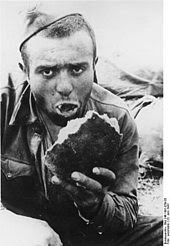 8,000 prisoners, mostly Jewesses and released from the originating camps with sick prisoners out of the the Hannover area, came to the concentration camp Bergen-Belsen. The last stop for 5,000 prisoners who came mainly from outside camps in the Braunschweig-Salzgitter area in February 1945, into Camp Wöbbelin, near Ludwigslust which was at that time still under construction. These two destinations were death camps, where thousands perished from hunger and disease: 1,000 in Wöbbelin and 3,000 in Sandbostel. What the number of victims with Neuengamme numbers among the 25,000 dead who died in the Bergen-Belsen concentration camp shortly before liberation or in the first few weeks after that, is not known. With the dissolution of the Neuengamme concentration camp there are two historical connecting events in their action and perception, however, they are completely opposite and show the inherent conflict between destruction and liberation in a particularly dramatic sense: The rescue of the Scandinavian prisoners by the Swedish Red Cross in relation to the remaining Neuengamme inmates on KZ-ships. In the last six weeks of the war the Neuengamme concentration camp became an assembly point for all Norwegians and Danish prisoners held in Germany. The establishment of a Norse Camp was the initiative of the Vice President of the Swedish Red Cross, Count Folke Bernadotte, which was granted to him by Heinrich Himmler in February 1945 as an input for the hoped for contacts with the British, with whom the chief SS leaders tried to avert a total defeat of Germany and negotiate a ceasefire. 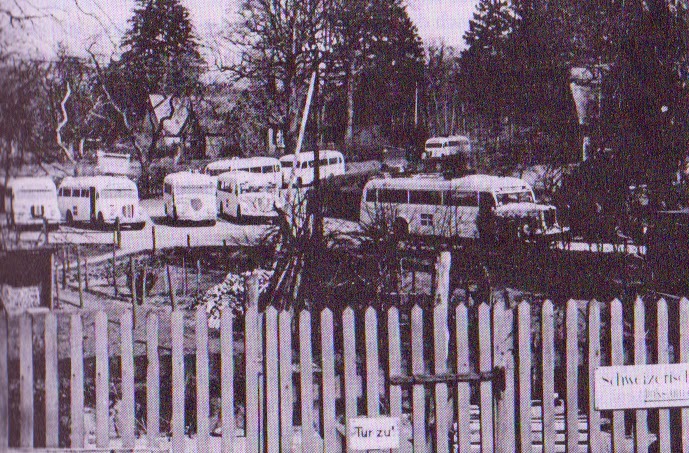 Having the sick brought out with the famous "white buses" via Denmark to Sweden before, over 4,000 Danish and Norwegian prisoners could leave Neuengamme on 20 April 1945 in about 120 buses and other vehicles and travelling towards freedom. On the same day began the complete evacuation of the main camp, in collaboration with the Higher SS and Police Leader 'North Sea', George Henning Graf von Bassewitz-Behr, who exercised command over the Neuengamme concentration camp, and organised certain aspects during discussions with the Hamburg Gauleiter Karl Kaufmann in the case of Allied enemy approximation. Kaufmann had in mid-April agreed under the influence of close companions and the Minister of Armaments Albert Speer, including the military commandant of Hamburg, Major General Alwin Wolz, and most representative of the economy, that further destruction after the bombing of 1943 had severely damaged the city, like the industrial plants and Shipyards, they feared a military defence of Hamburg would result in further destruction and decided to surrender the city to the British without a fight. Furthermore the leaders of both factions feared looting by freed forced labourers and reprisals by the victors. With this foreseeable encounter in mind, the capture of the city of half-starved prisoners and victims of mass crimes, they wanted the city free from concentration camp wretched figures. (KZ-Elendsgestalten) The solution was to put inmates onto ships. The loss of life in the Cap Arcona sinking is among the highest in Maritime History. The Cap Arcona was a large German luxury ocean liner formerly of the Hamburg-South America line that was sunk with the loss of many lives when laden with prisoners from concentration camps.The 27,500 gross ton Cap Arcona was launched in 1927, it was considered one of the most beautiful of the time. It carried upper-class travelers and steerage-class emigrants, mostly to South America. In 1940, it was taken over by the Kriegsmarine, the German navy, and used in the Baltic Sea. In the last few weeks of the war in Europe, the Swedish diplomat Count Folke Bernadotte, vice-president of the Red Cross, was organising the removal of Danish and Norwegian prisoners from German concentration camps to neutral Sweden — a scheme known as the White Buses. In practice the scheme also included other nationalities. On April 26, 1945, the Cap Arcona was loaded with prisoners from the Neuengamme concentration camp near Hamburg and was brought into the Bay of Lübeck along with two smaller ships, Athen and Thielbek. During these days, around 140 French-speaking, West European prisoners were transferred from the Thielbek to the Magdalena for transportation to hospitals in Sweden. This rescue operation was actioned by utilising information from British Intelligence, indicating their knowledge of the deportees on board. 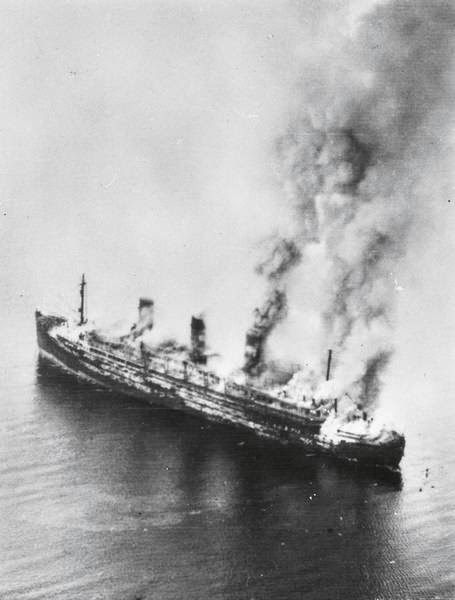 On May 3, 1945, four days after Hitler's suicide but four days before the unconditional surrender of Germany, the Cap Arcona, the Thielbek, and the passenger liner SS Deutschland ,converted to a hospital ship but not marked as such, were sunk in four separate, but synchronized, attacks by RAF Typhoons of 83 Group of the 2nd Tactical Air Force as part of general attacks on shipping in the Baltic. 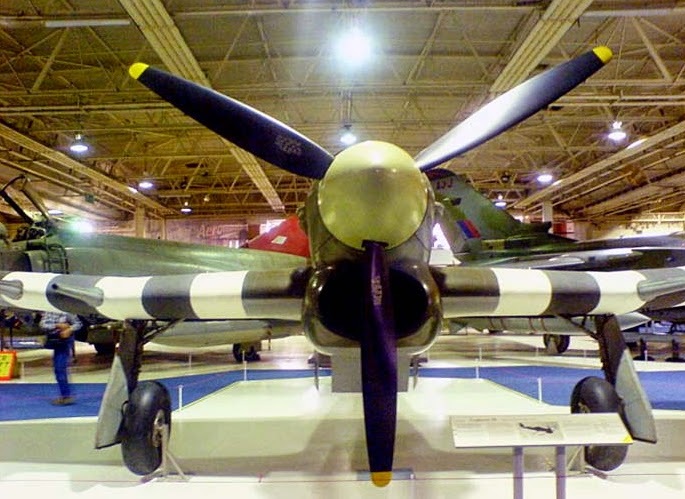 Hawker Typhoon Mark 1B fighter-bombers used "60lb" rocket projectiles, bombs, and 20 mm cannon. The survivors from the sinking who reached the shore were shot by SS troops, although 350 prisoners managed to escape from the massacre. 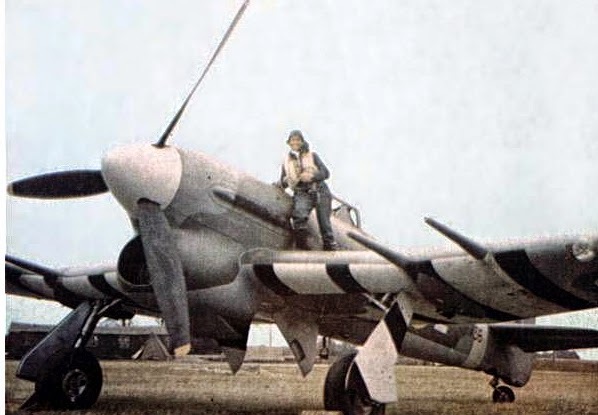 Allan Wyse, formerly of 193 Fighter Squadron said "WE USED OUR CANNON FIRE AT THE CHAPS IN THE WATER….WE SHOT THEM UP WITH 20 mm CANNONS IN THE WATER.HORRIBLE THING BUT WE WERE TOLD TO DO IT AND WE DID IT. THAT’S WAR.”About 490 of the various guards, SS and crew were rescued by German boats.Photos of the burning ships, listed as Deutschland, Thielbek, and Cap Arcona, and survivors swimming in the frozen Baltic Sea were taken on a reconnaissance mission over Bay of Lübeck by F-6 aircraft of the USAAF's 161st Tactical Reconnaissance Squadron around 5:00 PM, shortly after the attack. For weeks after the sinking, bodies of the victims were being washed ashore, where they were collected and buried in a single mass grave at Neustadt in Holstein. For nearly thirty years, parts of skeletons were being washed ashore, until the last find, by a twelve-year-old boy, in 1971. As a light rain began to fall on the afternoon of May 3, 1945, British soldiers of 6 Commando, 1st Special Services Brigade, searched the beaches of Neustadt, Germany, on the Baltic Sea for survivors. The bodies of men, women, and even small children lay by the hundreds on the sands. Offshore, under a gray, smoke filled sky, the soldiers could see the the still-smoldering hulk of the former luxury liner, the Cap Arcona, and scores of other damaged ships. A highly effective RAF bombing and rocket raid had destroyed the fleet and killed over 7,000 concentration camp inmates who had been imprisoned on the ships. One soldier found a girl of about seven clutching the hand of a woman beside her. He presumed she was the girl’s mother. Both bodies were clad in black-and-white-striped wool garments of concentration camp prisoners. The heads and shoulders of floating corpses were visible just offshore, as victims of all ages drifted in. Even a full year later, the bodies were still washing up. It’s a story no one would tell. The British government ordered the records to be sealed for 100 years. The sinking of one of the most glamorous ocean liners of the early twentieth century just had it’s 62nd anniversary, appears in no history books. The governments of Germany and Great Britain continue to to refuse either to discuss it or release pertinent records. So another war atrocity remains mostly a secret, like several other sinkings during the time period. 7000 dead is an awfully lot to not even be able to mention it, but that is the way wars are run. The sinking of the KZ- ships, which is at the same time one of the largest maritime disasters in history, the death marches, and the terrible conditions in the death camps of Bergen-Belsen, Sandbostel and Wöbbelin, all this shows, that at the end of the Neuengamme concentration camp was an Inferno. The number of prisoners who died in the last three weeks of the war can only be estimated. It can be assumed to be over 16,000. After the majority of the prisoners of Neuengamme had left, the camp had to be cleared completely by a 700-strong squad. The SS diligently and deliberately erased all traces of the crimes committed there. Prisoners who belonged to this residual commando, reported that all the huts containing straw and rubbish were cleaned, sometimes even the walls were freshly whitewashed and devious treacherous contraptions like gallows and beating blocks were removed. In addition to clearing up and dismantling, the SS undertook the destruction of all command records, documents of the Political Department, Camp Gestapo, and further all of the files, in the camp's written material. The last prisoners and SS men left Neuengamme on May 2, 1945. When British soldiers shortly afterwards entered the camp, although they were faced by a huge site with a number of barracks before them, what had happened there, apparently in this place, there was no traces. Neuengamme, which had been completely cleared and it was one of the large camps, no pictures of terror went around the world. All prisoners of German wartime concentration camps who perished while in German custody are routinely regarded as "victims of Nazism" -- even if they lost their lives as direct or indirect result of Allied policy. Similarly, all Jews who died in German captivity during World War II -- no matter what the cause of death -- are counted as "victims of the Holocaust." This view is very misleading, if not deceitful. In fact, many tens of thousands of camp inmates and Jews lost their lives as direct and indirect victims of Allied action, or of the horrors of the Second World War. For example, the many thousands of Jews who perished in the notorious Bergen-Belsen camp during and after the final months of the war in Europe, including Anne Frank, were primarily victims not of German policy, but rather of the turmoil and chaos of war. Among the German concentration camp prisoners who perished at Allied hands were some 7,000 inmates who were killed during the war's final week as they were being evacuated in three large German ships that were attacked by British war planes. This little-known tragedy is one of history's greatest maritime disasters. The Cap Arcona, launched in May 1927, was a handsome passenger ship of the "Hamburg-South America" line. At 27,000 gross registered tons, it was the fourth-largest ship in the German merchant marine. For twelve years -- until the outbreak of war in 1939 -- she had sailed regularly between Hamburg and Rio de Janeiro. In the war's final months she was pressed into service by the German navy to rescue refugees fleeing from areas in the east threatened by the Red Army. This was part of a vast rescue operation organized by the German navy under the supervision of Grand Admiral Karl Dönitz. All but unknown in the United States today, this great undertaking saved countless lives. The Thielbek, a much smaller ship of 2,800 gross registered tons, was also used to transport refugees as part of the rescue operation. In April 1945, Karl Kaufmann, Gauleiter of Hamburg and Reich Commissioner for merchant shipping, transferred the Cap Arcona and the Thielbek from naval command, and ordered them to Neustadt Bay in the Baltic Sea near the north German city of Lübeck. Some 5,000 prisoners hastily evacuated from the Neuengamme concentration camp (a few miles southeast of Hamburg) were brought on board the Cap Arcona between April 18 and 26, along with some 400 SS guards, a naval gunnery detail of 500, and a crew of 76. Similarly the Thielbek took on some 2,800 Neuengamme prisoners. Under the terrible conditions that prevailed in what remained of unoccupied Germany during those final weeks, conditions for the prisoners on board the two vessels were dreadful. Many of the tightly packed inmates were ill, and both food and water were in very short supply. On the afternoon of May 3, 1945, British "Typhoon" fighter-bombers, striking in several attack waves, bombarded and fired on the Cap Arcona and then the Thielbek. The two ships, which had no military function or mission, were flying many large white flags. "The hoisting of white flags proved useless," notes the Encyclopedia of the Third Reich. The attacks were thus violations of international law, for which -- if Britain and not Germany had been the vanquished power -- British pilots and their commanders could have been punished and even executed as "war criminals." The Thielbek, struck by rockets, bombs and machine gun fire, sank in just 15-20 minutes. British planes then fired on terror-stricken survivors who were struggling in rescue boats or thrashing in the cold sea. Nearly everyone on board the Thielbek perished quickly, including nearly all the SS guards, ship's officers and crew members. Only about 50 of the prisoners survived. The burning Cap Arcona took longer to go under. Many inmates burned to death. Most of those who were able to leap overboard drowned in the cold sea, and only some 350-500 could be rescued. During the next several days hundreds of corpses washed up on nearby shores, and were buried in mass graves. Having sunk in shallow water, the wreck of the capsized Cap Arcona remained partially above water as a grim reminder of the catastrophe. A particularly barbaric Allied war crime was the bombing on May 3, 1945, by British Royal Air Force planes of the passenger ships Cap Arcona and Thielbek in the Lübeck bay, packed with concentration camp inmates. Among the many 'nameless' victims were many prominent political figures, a fact that is hushed up today because the fact that concentration camp inmates, many of them resistance fighters against Hitler, perished as victims of the terror of the 'liberators' does not conform to the portrayal of the 'reeducators'. A unique tragedy is the end on May 3, 1945, of the 'Hamburg-South' passenger steamship Cap Arcona and the steamship Thielbek, both carrying concentration camp prisoners on board who believed that they were saved, but who were now bombed in the Neustadt Bay by Allied air planes. On the Cap Arcona alone, more than 5,000 perished -- ship personnel, concentration camp inmates, and SS guards. 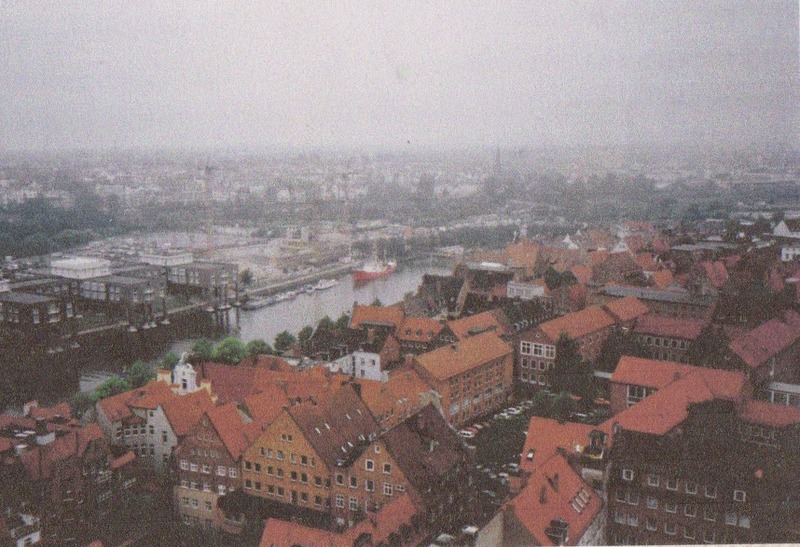 Nuestadt-Lübeck as it looks now, picture I took during my visit, the river is the Travemünde, where the bodies floated towards the Baltic Sea, visible in the right background. sic. The deaths on May 3, 1945, of some 7,000 concentration camp prisoners -- victims of a criminal British attack -- remains a little-known chapter of World War II history. This is all the more remarkable when one compares the scale of the disaster with other, much better known maritime catastrophes. For example, the well-known sinking of the great British liner Titanic on April 15, 1912, took "only" 1,523 lives. Actually, among the greatest naval disasters in history are the Baltic Sea sinkings of three other German vessels by Soviet submarines in the first half of 1945: the Wilhelm Gustloff, on January 30, 1945, with the loss of at least 5,400 lives, mostly women and children; the General Steuben on February 10, 1945, with the loss of 3,500, mostly refugees and wounded soldiers; and, above all, the Goya on April 16, 1945, taking the lives of some 7,000 refugees and wounded soldiers. Sources: Fritz Brustat-Naval, Unternehmen Rettung (Herford: Koheler, 1970), pp. 197-201; C. Zentner & F. Bedürftig, eds., The Encyclopedia of the Third Reich (New York: Da Capo, 1997), pp. 126, 644-645, 952; W. Schütz, Hrsg., Lexikon: Deutsche Geschichte im 20. 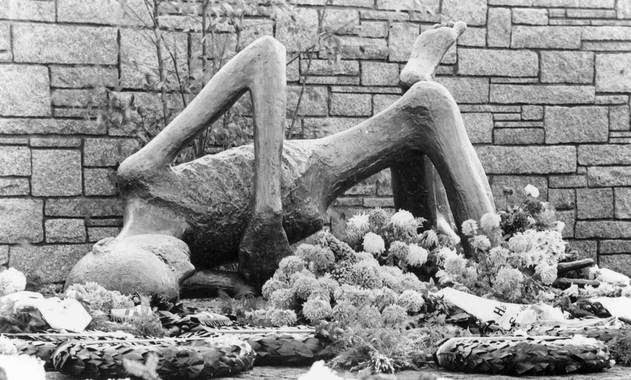 Jahrhundert (Rosenheim: DVG, 1990), pp. 66, 455; Dr. Bernhard Steidle, Hrsg., Verheimlichte Dokumente, Band 2 (Munich: 1995), pp. 212, 230; "Britische RAF mordete Tausende KZ-Häftlinge," National-Zeitung (Munich), May 19, 2000, p. 11; Kay Dohnke, "5 Minuten, 50 Meter, 50 Jahre: Gedenken an die Cap Arcona, nach einem halben Jahrhundert," taz: die tageszeitung (Hamburg Ausgabe), May 3, 1995, also on line at http://www.theo-physik.uni-kiel.de/~starrost/akens/texte/diverses/arcona.html; "The Cap Arcona, the Thielbek and the Athen," on line at http://www.rrz.uni-hamburg.de/rz3a035/arcona.html; Konnilyn G. Feig, Hitler's Death Camps (New York: 1981), p. 214; Martin Gilbert, The Holocaust (New York: 1986), p. 806; M. Weber, "Bergen-Belsen: The Suppressed Story," May-June 1995 Journal of Historical Review, pp. 23-30; M. Weber, "History's Little-Known Naval Disasters," March-April 1998 Journal, p. 22. For further reading, these books are available: Rudi Goguel, Cap Arcona (Frankfurt/Main: Röderberg, 1972); Günter Schwarberg, Angriffsziel Cap Arcona (Hamburg: Stern-Buch, 1983/ Göttingen: Steidi, 1998), with portions on line at http://www.reger-online.de/buchcd/w7506002.htm; Wilhelm Lange, Cap Arcona: Dokumentation (Eutin: Struve, 1988). Despite these difficult conditions prisoners still tried to resist the structural hierarchy of the Camp Administration, which took place in various forms, and initially included contact with each other and thus to organize themselves illegally into cells. First they formed national resistance groups in small circles, and later an international Camp Committee was established, whose influence was largely confined to a narrow faction of political Prisoner Functionaries, while the majority of prisoners had neither knowledge nor gained directly from any activity they perused. Meaningful were the dissemination of intercepted radio messages (also using self-made receivers) and the allocation of lighter work for those inmates already severely weakened. Due to the interaction of Eminent Persons [These are, in particular, the Polish inmate doctor Maurycy Mittelstaedt and French professors Florence, Prenant and Quenouille as well as the Communist Albin Lüdtke from the Rhineland and Andre Mandrycxs from Ghent/Belgium working in the camp offices sic]. These prisoners employed in the offices and in hospital districts that performed spectacular acts of defiance, often narrated about the theft of drugs from SS held supplies, that of hiding patients from selections or falsifying of data in the camp records for the rescue of prisoners. Only to mention one example of December 1943 while prisoners working in the office had became aware that a 27-year-old Soviet military doctor who had his Jewish origins kept hidden, was scheduled to be hanged. With the cooperation of several Functionary Prisoners made it possible that Sergej Kartaschow (the victim) was under the pretext as being sick on the same day transferred into the infirmary. In the morgue, lay a body of about the same age and similar type as Kartaschow, who had his number written with a stylus pen removed from his chest and replaced by the number of Soviet doctor. 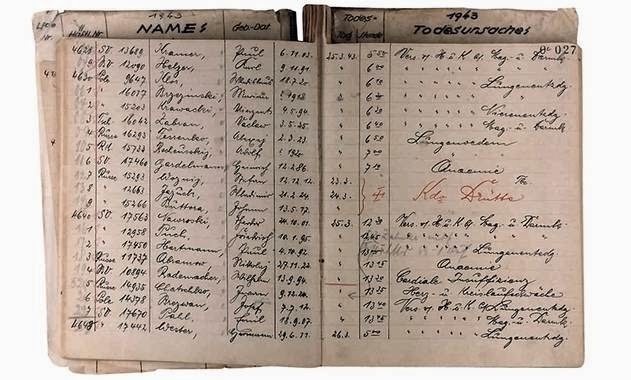 In the Death Register (Totenbuch) Sergej Kartaschow is listed under the date December 21, 1943 as deceased. (The statement reads: "Sergej Kartaschow, RK Nr. 25498, born 03/11/1916, died 21/12/1943 at the failure of the cardiovascular system and pneumonia" in: ANg, Krankenrevier-Totennachweise ) In fact, he was under the name of the actually deceased transferred with the next transport to the sub-camp Salzgitter-Drütte. He was able to experience the end of the war and liberation. His salvation is attributed to the work of the Belgian Communist Andre Mandycxs, who worked in Neuengamme since early 1943 in the labour assignment office, trying to coordinate numerous resistance activities. [The question remains what happened to Kartaschow after his return to the Sowjet-Union, as Stalin considered all former POW's as traitors. The prisoners’ showers, camp detention area, and prisoners’ kitchen in the former camp. In the background on the left are the brick prisoners’ barracks, which still stand today. The support services were generally limited to members of their own group. Group solidarity in general, encompassing all, was usually far less in evidence. In view of the hunger in particular, combined with hard work and SS terror, the first and foremost precondition was for their own survival. Against this background, the relief efforts for the 1,000 Soviet prisoners of war who came in October 1941 to Neuengamme and were secreted by the SS, is in particular worth remarking about. 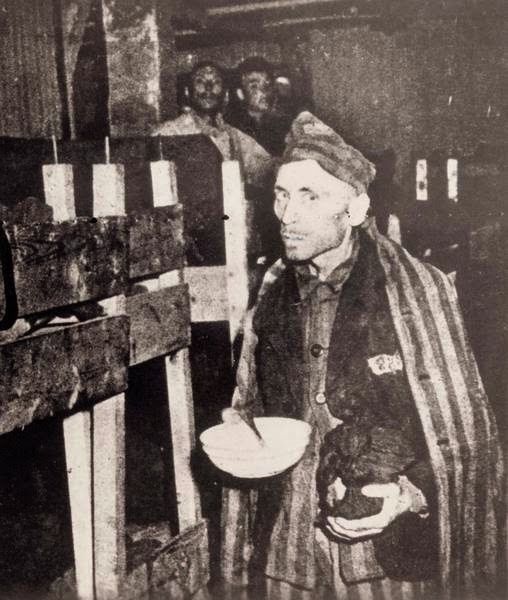 Prisoners of different groups, one of their initiators was the kitchen Kapo Bernhard Wolf, a prisoner with the green triangle, led a bread collections programme for the ragged and totally unnourished Red Army soldiers. Several prisoners declared themselves ready to provide medical assistance for them in this special section of the camp, including four Polish doctors and one German. Such examples of unselfish assistance are among the supporting documents is a fraction for a split up of the inmate population, were individual interests to fight for their own survival, barely bridged the dividing lines. They ran between about ten percent of the 'Prominierten', while the mass of prisoners in their entangled life of the daily struggles of survival was paramount and at the lowest end the stationary and already scarred by the death, the fate of the 'Mussulmans'. Attempts to escape by fleeing the terror was very controversial among the prisoners and of dire consequences, the SS left the prisoners usually so long on the assembly grounds until the escapee was captured and had right from start of his attempt virtually no chance of success. The adjutant of the commandant of Neuengamme estimated the number of attempts to escape from the concentration camp and sub-camps to about 400 to 500. However, no case of a successful escape before April 1945 for the main camp is known to this day. With the turn of the war in 1942 a new phase in the development of the concentration camp system, aimed at the widest possible use of the work potential of the prisoners on arms and other war functions, commercial or military projects was planned. The SS who had previously faced the idea of a prisoner use in the defence industry and saw this as an adverse move, they finally agreed under pressure of growing labour shortages, that is was for security reasons and in view of its subsequent financial benefits that private or state-owned companies would relocate their production directly to or into the camp sites. 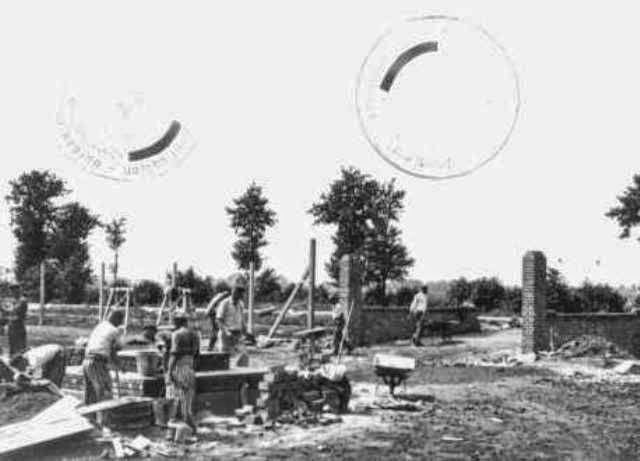 Then several armaments factories were relocated into Neuengamme, the construction activities were carried out under the direction of the SS construction management by prisoners. In March 1942, thus began the operation for the Hamburger "Engine Factory (Motorenfabrik) Carl Jastram" where finally up to 300 prisoners in engine and shipbuilding (Torpedo ejection pipes and water tanks for submarines, repair of boat engines) were employed. 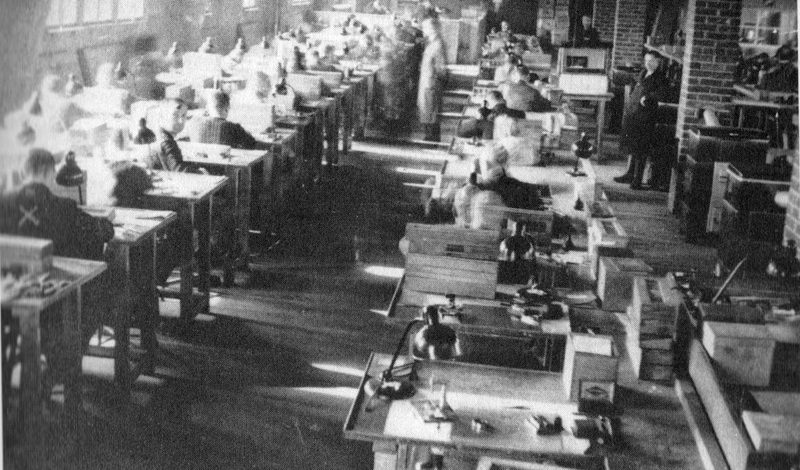 Up to 150 prisoners were in the"German Measuring Apparatus GmbH"(Messap), whose main operation was in Hamburg-Langenhorn also had concentration camp prisoners and forced labourers who were mainly engaged in producing time fuses for grenades. For both operations six workshop-barracks were built south of the brickworks factory (Klinkerwerke). 'Prisoners at work in the commando Messap'. Note: This is an illegal picture-taking of a civilian worker. A new expansion area was created for the "Metalworks Neuengamme GmbH", a subsidiary of the Thuringian weapons manufacturer Carl Walther, an over 10,000-square-meter manufacturing plant with elongated major axis and three transverse wings had to be dug. This plant was listed under the code name "production site"(Fertigungsstelle). It started in the second half of 1942, excavation and construction work was a dreaded work detail. 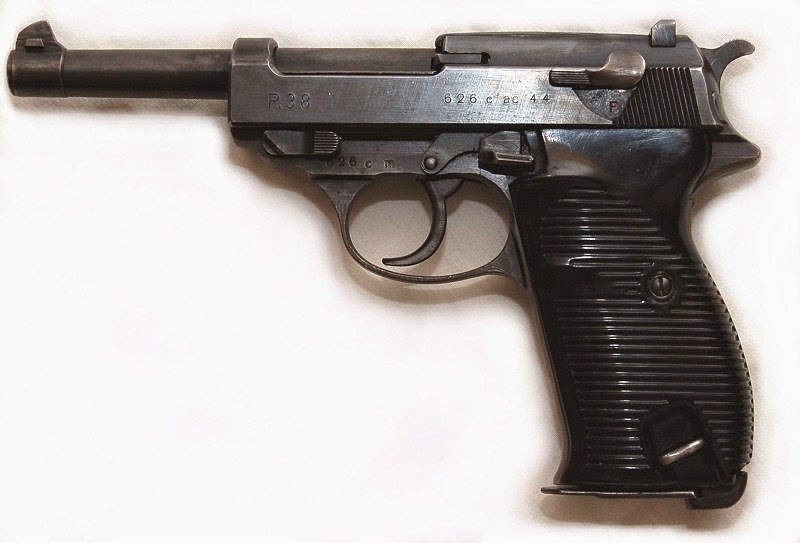 In contrast, the conditions in production environments improved somewhat although they had started assembling the pistol Pi-38 in makeshift shacks already in January 1943, but in the new factory system after changing the product line on the self-loading rifle K-43 and after delivery of all machinery which was only completely finished in the second half of 1944 with about 900 to 1.000 prisoners working there. In a large-built Barracks complex in 1943/44 the "Industiehof" which was the SS-owned "German equipment plants"(Deutschen Ausrüstungswerke), were mainly for the supplies of the Waffen-SS, for example, they manufactured garrison furniture, camouflage nets, boxes and cartridges pouches. The functional change was accompanied in the case of KZ Neuengamme a restructure in commander postings. After Martin Weiss (Weiß) was appointed with effect from 1 September 1942 as commandant of the Dachau concentration camp, to Neuengamme came the previously operating as commander in Stutthof Obersturmführer Max Pauly, who succeed him. 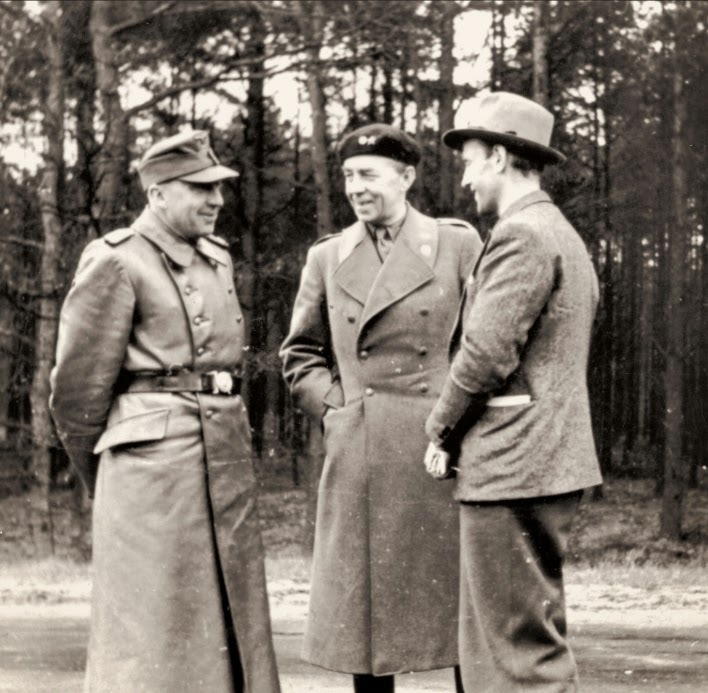 Himmler and Pohl, head of the SS-WVHA, considered both, the qualified electrical engineer Weiss, and as a trained trader (Kaufmann) Pauly suitable in realizing the required economization of the camp and the efficient use of available prison labour. In the course of efforts during 1942 to use prisoners on a large scale in the armament production, the WVHA ordered measures to reduce the mortality rate in the camps to improve inmate care and thereby increase performance, this brought in Neuengamme a number of changes with it, (establishment of additional medical facilities, permission to use inmate doctors, permission to receive parcels from home, abolition of particularly cruel punishments such as the pole hanging, introduction of a bonus system and permission to participate in cultural and sporting activities). For the majority of prisoners, however, the living conditions due to the poor food situation and the ruthless extortion of labour continued to deteriorate. Also, abuse and harassment remained on the daily agenda. The situation was different in case of skilled workers. Here was the economic interest of the SS, and in some cases significantly improved the survival chances of these prisoners. Already since 1942 prisoner working commandos, contrary to the original intent of the SS, had been used on outside industrial sites. 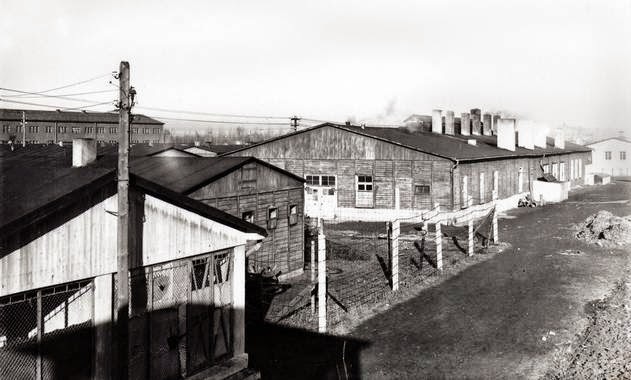 As early as April 1942, 500 detainees had been transferred to a Volkswagen factory-owned "Arbeitsdorf" (Workers Village), which was in fact self-administrated in the initial phase but still under the guidance of the Neuengamme commander Martin Weiss. 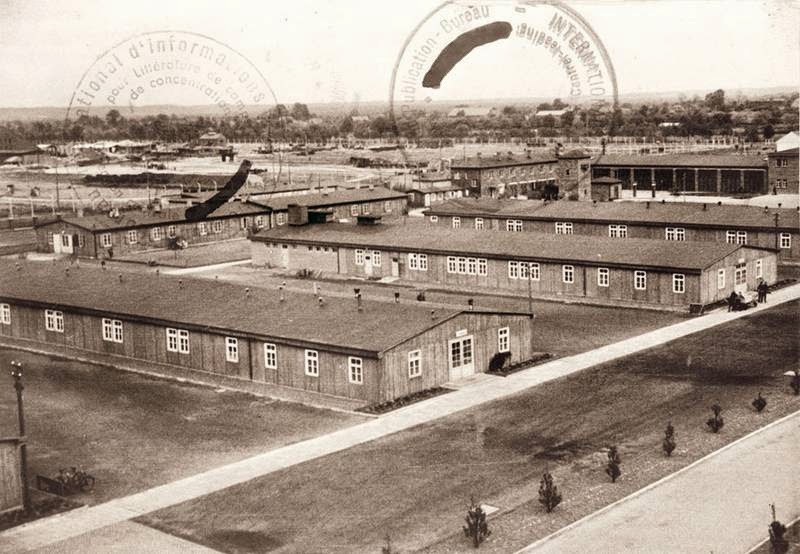 The first-built satellite camp by private Enterprises outside the camp were erected in August 1942 at the Phrix plants in Wittenberg. This was the first ever own concentration camp in a non-business enterprise, and in October 1942 at the 'Reichswerke Hermann Göring' in Salzgitter-Drütte. At the same time, 1,000 prisoners of Neuengamme were transferred as SS-brigade number II to Bremen and Osnabrück to do clean-up jobs there after bomb attacks in affected areas of these cities. 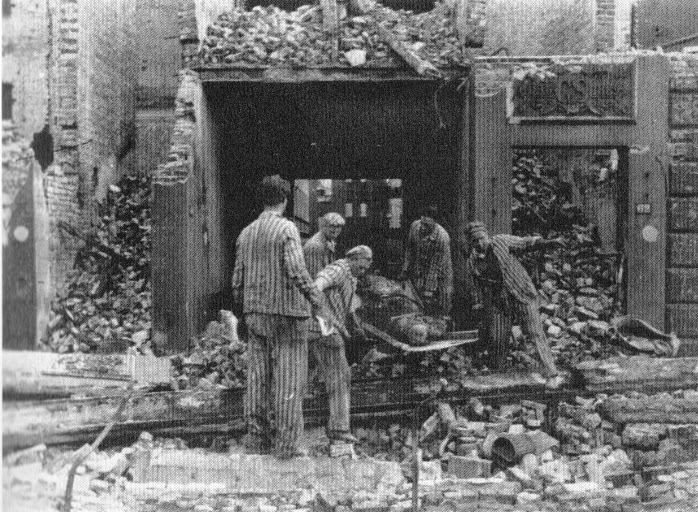 In the following years prisoner were engaged still further north in German main centres such as Hamburg, Kiel and Wilhelmshaven, on factory transshipment sites and after major attacks on the Reich Railway Network in Soest/Bad Sassendorf, Uelzen, columns of prisoners removed debris from collapsed dangerous and vulnerable ruins, took part in recovering corpses and their subsequent disposal or burial, and as special commandos, a highly skilled function, (Feuerwerker) responsible for de-fusing and demolition of unexploded bombs. 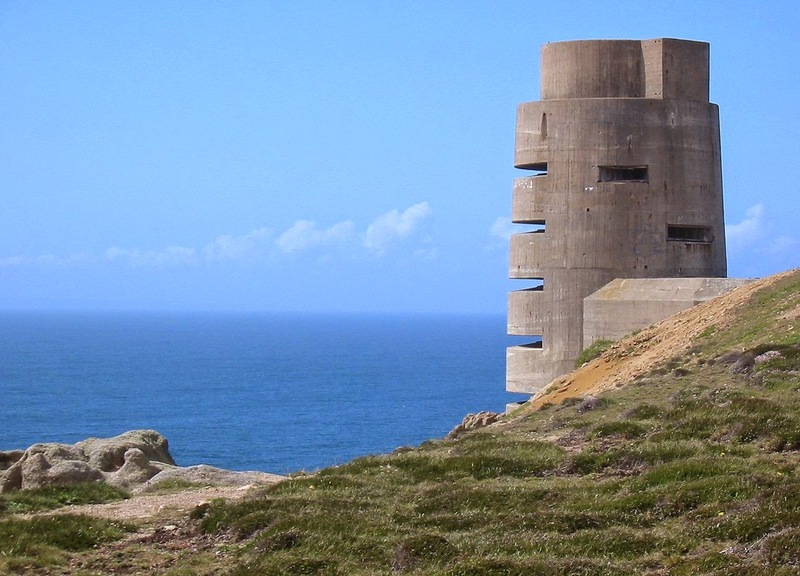 In March 1943, the WVHA subordinated the SS Construction Brigade I, to the Neuengamme camp management which was reassigned to the occupied British Channel Island of Alderney in the construction of fortifications. The Channel Islands were the only part of the British Commonwealth occupied by German Armed Forces. 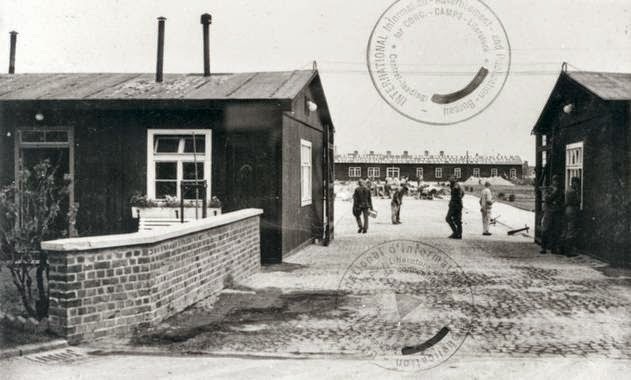 The Germans built four Neuengamme sub-camps on Alderney Island—the Alderney concentration camps—and named them after the Frisian Islands: Lager Norderney, Lager Borkum, Lager Sylt and Lager Helgoland. The Organisation Todt operated each sub-camp and used forced laboureres to build bunkers, gun emplacements, air-raid shelters, and concrete fortifications. The Alderney concentration camps had a total inmate population of about 6,000. Norderney camp housed European (usually Eastern but including Spaniards) and Russian forced labourers. The prisoners in Lager Norderney and Lager Sylt were slave labourers forced to build the many military fortifications and installations throughout Alderney. Sylt camp held Jewish enforced labourers and was a death camp. 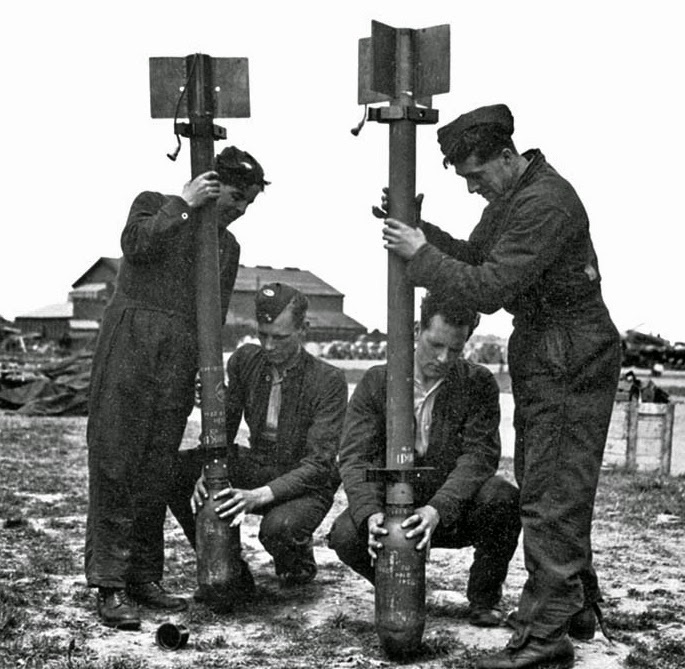 Lager Borkum was used for German technicians and volunteers from different countries of Europe. Lager Helgoland was filled with Russian Organisation of Todt workers. In 1942, Lager Norderney, containing Russian and Polish POWs, and Lager Sylt, holding Jews, were placed under the control of the SS Hauptsturmführer Max List. Over 700 of the inmates lost their lives before the camps were closed and the remaining inmates transferred to Germany in 1944. After World War II, a court-martial case was prepared against former SS Hauptsturmführer List, citing atrocities on Alderney. However, he did not stand trial, and is believed to have lived near Hamburg until his death in the 1980s. In the meantime, the number of inmates in the sub-camps gradually approached that of the main camp at: (August 1943 the main camp held circa 5,800, the sub-camps circa 3,700 inmates). In the second half of 1943 two more locations were added., This was the prison labour used in the accumulator factory at Hannover-Stöcken and in the construction of the submarine bunker "Valentin" in Bremen-Farge. The vast number of other sub-camps emerged only in the last year of the war, as branches for them in the defence firms in northern Germany were built. As part of the "Geilenberg program" which had to safeguard production from bombing the German oil industry, thousands of prisoners had to perform clean-up operations at refineries. Towards the end of the war, the military war economic situation increasingly deteriorated, the National Socialist leadership had decided under pressure due to serious labour shortages in Germany to consider also recruitment among the deported people from extermination camps in the East, where certain Jews had been selected for elimination (the German title reads 'murder') and take them rather for the Reichs-wide use in armament factories. Totalling more than 12,000 Jewish prisoners were allocated for Neuengamme, which the SS had mainly selected from Auschwitz and some other camps, but also directly from Budapest . Only a small part of them remained in the main camp, as most newly built sub-camps in other locations, which were often designed exclusively for Jewish prisoners were available. The majority of them in these camps worked around those heavy building projects such as the construction of an underground tunnel system in Hannover-Ahlen. 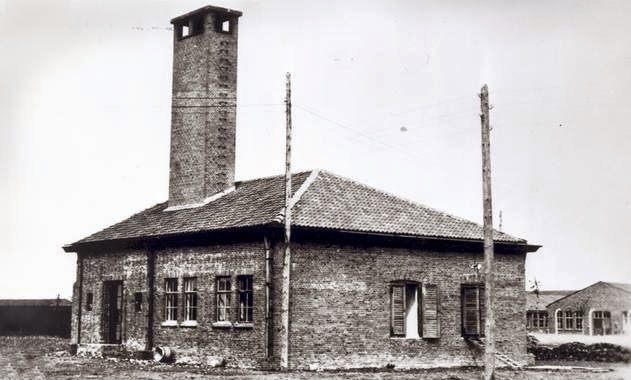 Although the main camp Neuengamme remained as a detention facility for men, but from the total of 86-99 sub-camps [some are not clearly defined as such,sic] 24 were occupied by women. The establishment of women's sub-camps all emerged only in the last year of the war, and differed greatly from the general inmate composition. Among female inmates were in the great majority Polish, Czech and Hungarian Jewesses, who were transferred from Auschwitz-Birkenau into sub-camps camps of Neuengamme. The non-Jewish prisoners came mostly from the Ravensbrück concentration camp. The living and working conditions of these women did not differ from those of male prisoners, they also had to do hard physical work during a shift system and produced, for example, from the clinker plant at Neuengamme, and manufactured there finished parts to build panel houses for bombed-out apartments in Hamburg. The "Station"(der Bahnhof) inside the Neuengamme concentration camp, 1944. The siding was prepared in 1943-44. In the wagons as from spring 1944 prisoners and goods were transported into the camp. The importance of sub-camps shows by the fact that at the end of the war there were three times as many inmates imprisoned in them, than in the main camp: At the end of March 1945 the sub- camps had in the last quarter as indicated in a report by the SS garrison doctor dated 29 March 1945, 39,880 prisoners, including 12,073 women, contributing as slave labour for the war economy. At the same time, up to 14,000 prisoners were held in completely overcrowded Main Camp (Stammlager). With the establishment of sub-camps often located in the middle of cities, and individual work assignments even in busy areas with daily trips between locations and the camps, KZ inmates were increasingly perceived at the end of the war by the civilian the population. Where the jobs were not, or only difficult to define, the prisoners came with foreign forced labourers and German staff members in contact. Sometimes there were little signs of Solidarity, for example, it was reported of secretly surrendered food left behind, but this describes the common reactions through their own experience. Unfortunately, inmates claimed that in the last years of the war the largely blunted civilian population, treated them with contempt, indifference and looking away. Since the winter of 1940-41 the incoming transports to Neuengamme concentration camp consisted mostly of foreign prisoners. Soon their number overtook the German nationalities by far. During the war, the Gestapo and the SS Security Service (Sicherheitspolizei), deported tens of thousands from all the occupied countries of Europe as concentration camp prisoners to Hamburg-Neuengamme. They were mostly people who resisted what the German occupation regime had done, in retaliation they had fallen victims by the Wehrmacht and SS who had rebelled against the prescribed forced labour or were persecuted as Jews. Many detainees were subjected to arbitrary reprisals. 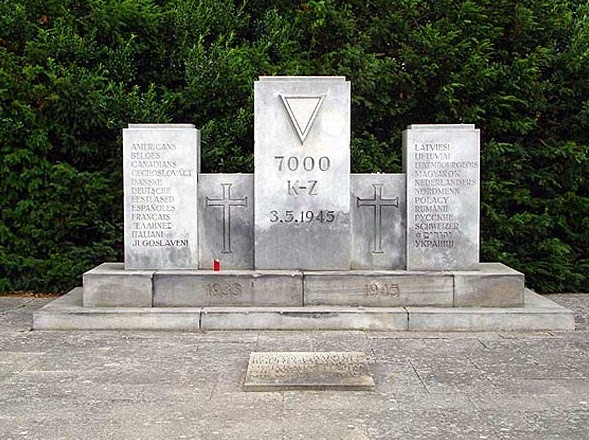 Among them were, for example, several thousand that were arrested after the Warsaw Uprising in 1944, Polish women and men, or the 589 men from the Dutch village of Putten, who were deported in October 1944 in retaliation for an attack on a Wehrmacht Army car, and transported to the Neuengamme concentration camp, only 49 of them ever returned . Putten was later called the 'Village of Widows and Orphans'. 'Entrance to the prisoners’ compound. 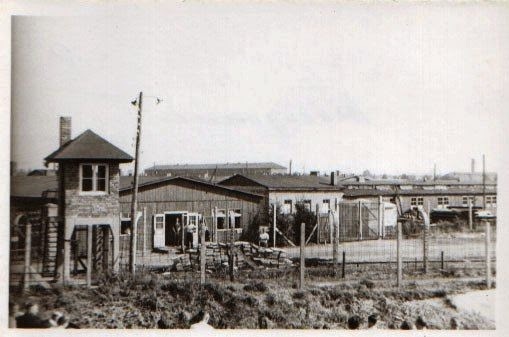 On the left and right are the wooden barracks for the commanding officer of the prisoners’ compound (Schutzhaftlagerführer) and the reporting officer (Rapportführer). In the background, the roll call square and the kitchen barracks can be seen. The Jews, depending on the reason for their internment (Haftgrund) had a second yellow star added to their patch in the opposite direction, so that a hexagonal 'Star of David' was created. They formed in the Neuengamme KZ initially a relatively small group of a few hundred prisoners. From 1940 to 1942, their share amounted to little more than five percent. The Jewish prisoners were subjected to very extreme conditions. When work assignments for the 'Commando Elbe' were assembled as well as the prisoners of the penal company who had to work on Sundays, the SS put them together into specific columns. There the Jews had to endure many tortures and harassments. Included for example the infamous 'death round'(Todesrunde) in which prisoners with overflowing carts, and often under beatings, had to go on the run several times and make additional rounds. Functions in the prisoner administration were not allowed to cloth the Jewish prisoners in general. The reception of parcels for them was forbidden, as were, from time to time, any correspondence. For a long time they also were forbidden in entering the infirmary, so that medical treatment of the sick and care for wounds from work accidents was omitted entirely. The deplorable working conditions and the continued mistreatment caused a large number of deaths among the Jewish prisoners: 130 of them, that is every third to fourth died in the first nine months of 1942. Prisoner with a bowl. This is a detail of a photograph taken shortly after the Wöbbelin satellite camp was liberated in 1945'. The Jews who had not yet fallen victim to the terror, were taken away without exception from the Neuengamme concentration camp during the summer and fall of 1942. In the first group are those under the Aktion 14f13 selectees who were murdered in June 1942 in the gas chamber of Bernburg. The remaining Jewish prisoners in Neuengamme were deported in the fall of 1942 to the Auschwitz concentration camp. This was done in executing an instruction that the commander had received from the SS-WVHA on 5 October 1942, in which it was said that 'all Jews located in the Reich KL shoud be free of Jews' (judenfrei) upon request by the the Reichsführer SS Heinrich Himmler. Although the racial ideology classification towards the different treatment of the various nationalities in the camp was, but for their respective positions in the camp, and for other factors very decisive. First ranked the Czechs and still more so the Poles that since 1941/42 formed the largest national group, which by SS standards were at the lower end of the scale value. 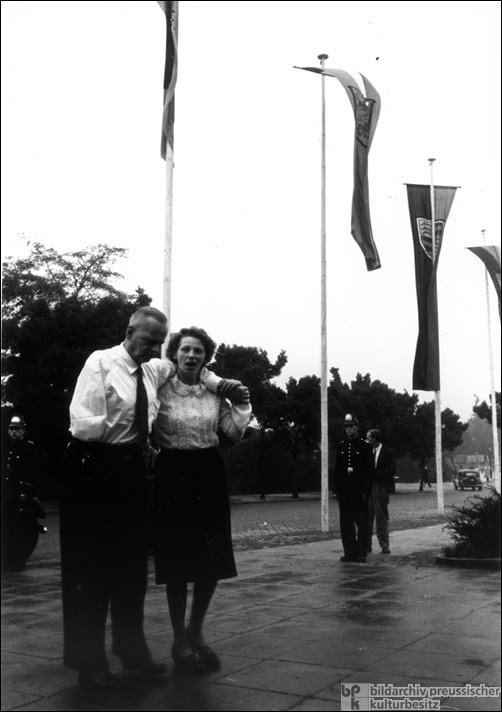 While non-Jewish German prisoners usually after a certain time gained access to relatively easy employment, in offices and other functions, and also from the fall of 1941, the Belgians and the Dutch had opportunities for improvements during their internment. Members of the Slavic nations were often for several months exposed to the deadly long term conditions in the mass assignments with excavation and construction work, such as the 'Commando Elbe'. They were also particularly victims of abuse. Still unequal bad was the situation in October 1941 of the secreted 1,000 Soviet prisoners of war at the camp. They were given no chance of survival, their treatment was rather part of a racial extermination policy. In 1942 Russian and Ukrainian slave labourers were brought in large numbers into the camp, and moved to the bottom end of the national ranking. With their intake mainly Soviet prisoners now presented the strongest group in the concentration camp from 1943, used in the heaviest work details, the clay pits and the construction of the docks as well as excavation, in the 'Commando Manufacturing Site'(Kommando Fertigungsstelle) where particularly infamous 'green' and 'black' Kapos on behest of the SS abused and killed countless prisoners. In addition to the racial hierarchy which was applied for a national group, as for each inmate, but also the time of entry was of decisive importance. The later a group came into the camp, the more difficult it was for them to compete there. Inmate functions, craftsmen and skilled workers, and other places of survival possibilities bidding for these jobs were already occupied. Since the living conditions generally worsened, the situation for 'newcomers' was now more difficult. Including particularly the Danes and French that in 1944 were brought in large numbers into the concentration camp had to suffer when used for the hardest work details and in satellite camps regardless of their position in the racially biological value scale of the SS, while not a few Polish, sometimes even Soviet prisoners, especially if they had specific professional skills were now moved up in the camp hierarchy as skilled workers taking positions in armaments production or were partly the reason for survival with their up-scale tasks. In this temporal shift in the French prisoners accounts in the camp which can be explained in a comparatively high death rate. From the diversity of the individual prisoner groups to form a coercive society in the camp, numerous problems were found. A major difficulty was in the various languages, another was the sometimes competing group interests. The SS tried the national resentment among the prisoners and matches them between the different groups to foment existing contradictions and encourage them to their own deceitful purposes. Slave Labour in Brick Production. Brick carts in front of the ramps of the former brick factory. The six and a half year history of Neuengamme concentration camp is intimately linked with the history of Hamburg in the Third Reich. Even the founding of the camp was heavily influenced by Hamburger interests. 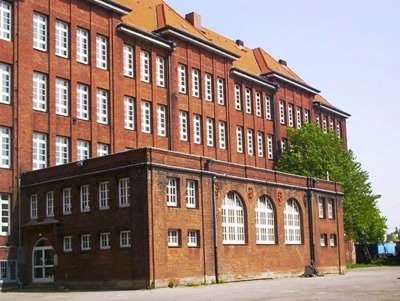 First, the city was looking for a replacement for the established in September 1933 part of a prison and concentration camp located within the city at Fuhlsbüttel. On the other hand, it was primarily economic expectations, which made Hamburg as a location for a new foundation of a camp lucrative. From 1936-37 it was the targeted use of prisoners as a work force for the needs of the SS as an essential factor in having concentration camps. 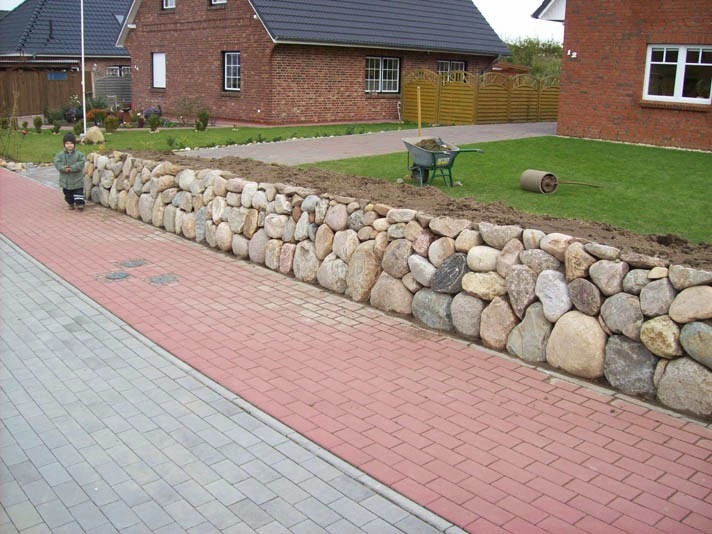 First area of activity was the building a material industry, which was the reason that the 'Deutsche Earth and Stone Werke GmbH (Erd und Steinwerke GmbH) was founded for the organization, responsible for marketing and profit. As shareholders acted mainly members of the SS leadership. At the same time, the SS began to build new 'modern' concentration camps, which were now designed as 'labour camps' in contrast to the previously used primarily for political opponents of the regime in early concentration camps and were either like the ones in1938 built at Flossenbürg and Mauthausen, usually close to quarries, where large clinker plants were constructed. This was the case, from December 1938 until the spring of 1940 for Buchenwald and Neuengamme which were initially run as satellite camps of Sachsenhausen from December 1938 until the spring of 1940. The German Earth and Stone Works purchased in the fall of 1938 on the outskirts of the village of Neuengamme in Hamburg-Vierlanden, for years a disused brickworks plus land in a total size of 50 acres, which was suitable for the mining of clay. On December 12, 1938, 100 prisoners from Sachsenhausen arrived in Neuengamme, which should make the brickworks (Ziegelei) again ready for use. They were quartered provisionally in the attic of the company building above the drying chambers. First, to be carried out, they had to do the clean-up, repairs and renovation works, then the first production trials were undertaken. Although the prisoners had to work hard, but the prison conditions differed significantly from the conditions that prevailed later in Neuengamme. Three months after the outbreak of war the final decision was taken to expand Neuengamme to a large concentration camp. Following a visit of the Reichsführer SS, Heinrich Himmler, during January 1940 negotiations began between the SS-Leadership and the city of Hamburg, where the city expressed its 'biggest interest to the extensions of the brickworks operated with prisoners'. Because the Hamburg Party Leadership(NSDAP)had big plans: A comprehensive 'redesign' of the Altona riverbanks should make Deurtschlands(Germany's) "Gateway to the World" like a 'business card invite, what National Socialism' can achieve. The plan was to build a monstrous 'Führer-Building', a 250-meter-high Gauhochhaus,(Gau High Rise-Building) a 'Strength through Joy' hotel (Kraft durch Freude), a peoples hall(Volkshalle) for 50,000 persons and a high bridge over river Elbe. 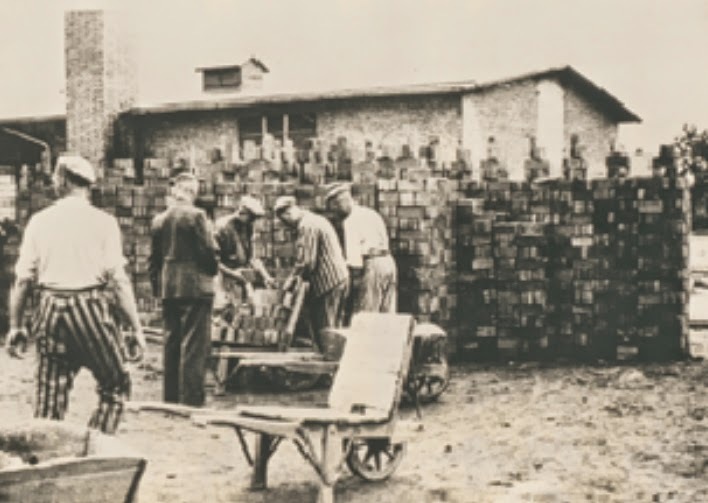 Since the planning of the task force of the 'Architect of the Elbe-Shore' for the planned buildings, had to design in the North German tradition to incorporate a cladding with clinker bricks, the Hamburg Administration was very pleased with the opportunity to significantly reduce the cost of construction by the labour of concentration camp prisoners . For these plans, the old brickworks was no longer sufficient, especially since it had come there to technical problems. 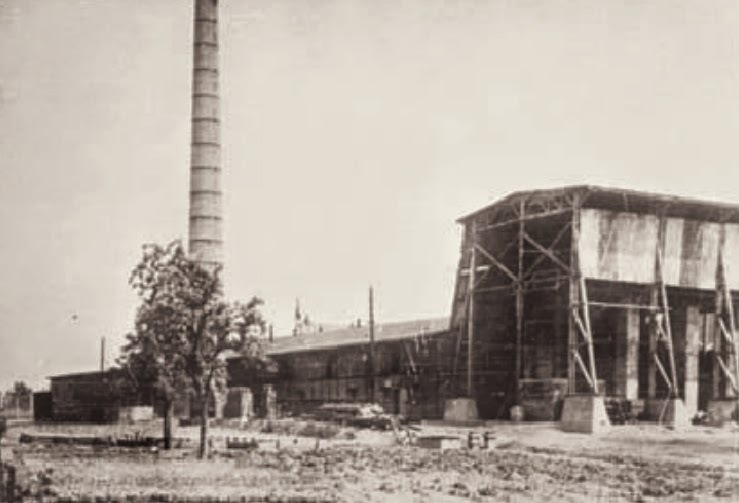 In order to increase production to 20 million annually and further expand up to 40 million clinker bricks, they had to be established a larger and more modern brickworks. 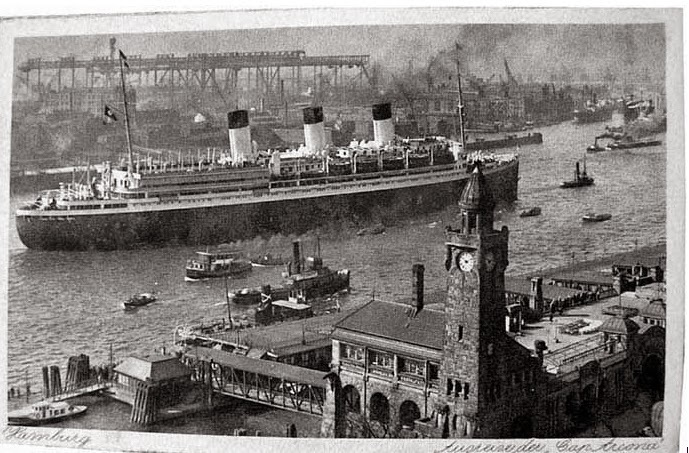 About the project the Hansa City of Hamburg and SS-Enterprise Deutsche Earth and Steinerke GmbH signed a contract in April 1940, in which the SS put the most favourable freight rates forward. The city of Hamburg granted for the construction of the plant, a loan of one million Reichsmarks. 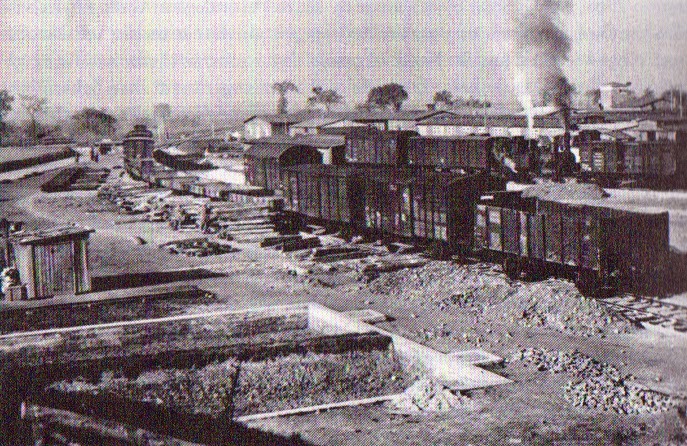 To make it the brickworks accessible to rail and waterways, the city undertook the manufacture of a railway siding, regulating the partially navigable 'Dove Elbe' and to build a branch canal with docking facilities. At the same time, the SS would provide, 'for these projects prisoners as labourers and the required Guards free of charge. 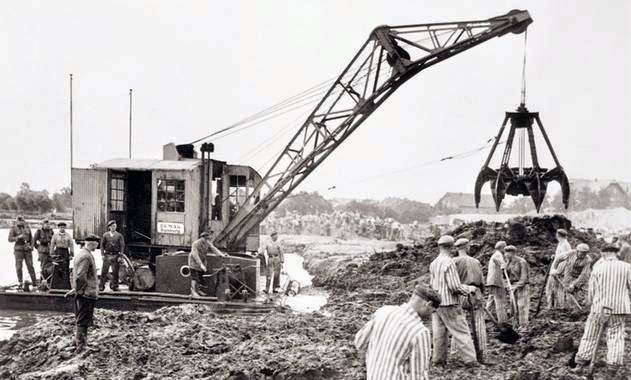 The prisoners in the Neuengamme concentration camp, whose number was growing rapidly and at the end of 1940 was already as high as 2,900, they worked mainly on the enlargement of the camp, in the construction of the new Klinker plant and in the clay pits. On an average 1,000 prisoners were used under contract broadening and deepening of the 'Dove Elbe' canal on a six kilometres long stretch, the construction of the branch canal with docking facilities, including a wharf to receive and loading of goods. 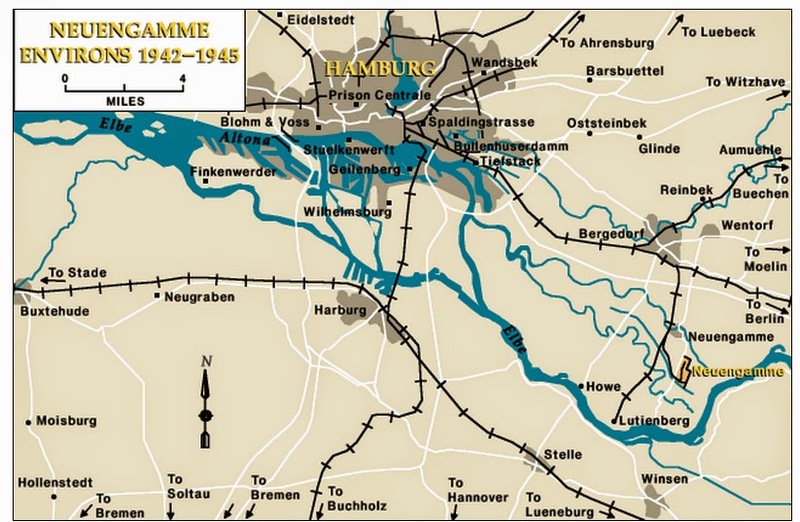 Even after 1943 the works of the 'Dove Elbe' canal was complete, and the transports by barges and ships was taken up, the extension of quays at Neuengamme harbour was continued until the fall of 1944. 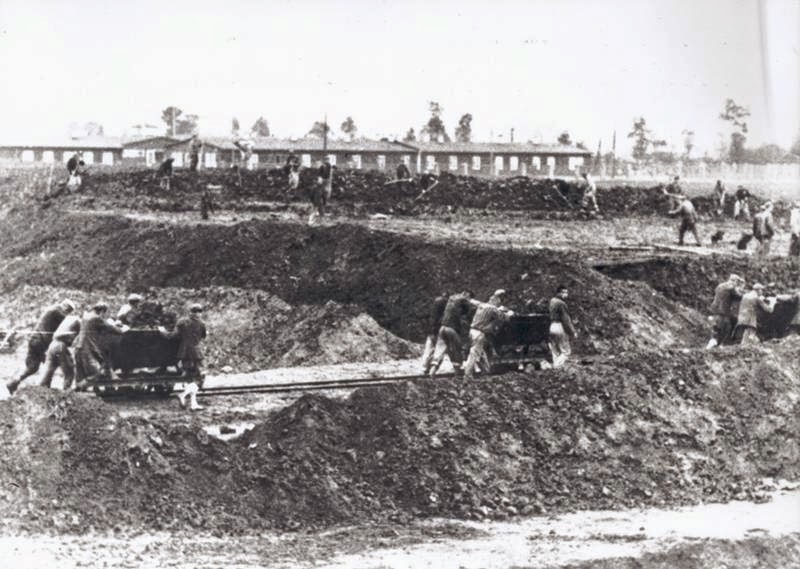 The working conditions for the prisoners in the 'commando Elbe' were very poor: Under the constant driving of the SS to move the earthworks with wheelbarrow and filled by shovel had to be done at a run, and this took place on a twelve-hour-day with far too little food and clothing that did not protect against wet and cold weather. Many were also victims of abuse by the SS as well as individual prisoner-foremen and Kapos, who tried with blows to increase the pace of work. It was part of everyday life that detainees were driven into the 'Restricted Zone', where they were shot by the sentries. 'killed while escaping'. Although in the phase of the camp construction forcing a high performance, more than targeted achievements, stood always in the foreground. However, the only purpose of work was often the chicane. So Jewish prisoners were in the winter of 1940-41, when work of the 'Elbe commando' had to be delayed because of severe frost, yet more laborious earthworks was carried out in these conditions only by Jews, but under these conditions hardly anything was accomplished and work after the end of the frost with far less effort could have been made. The only reason was no doubt chicanery and mistreatment. 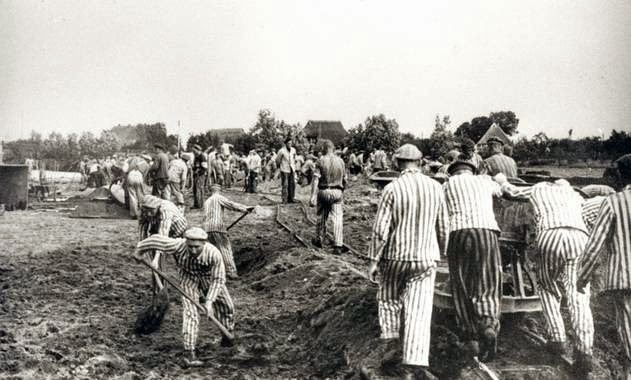 From the perspective of the SS, the decisive criterion for the right to live in a concentration camp was, that prisoners had the ability to work. Was this not the case, as expected from the SS they did not always wait, until the prisoners slowly starved and were completely exhausted at the work site, in the barracks or at the often extended for several hours standing at Roll-calls. In January 1942 prisoners were in the Neuengamme concentration camp for the first time after a rapidly rampant typhus epidemic which had in the previous month erupted, were killed by phenol or Benzine injections in the infirmary. The victims included primarily Soviet prisoners of war, which, like the Jews were in the racist scale value of SS at the lowest level. From 1,000 Soviet soldiers who were transferred in October 1941 from the POW camp XD Wietzendorf and had been admitted to a fenced labour camp for 'POW of the Waffen SS' and declared the area as such within ​​the concentration camp, 652 died within six months of starvation, typhus and murders by the SS. Usually the dead were taken to the urban crematorium in Ohlsdorf or since 1942 were cremated in the camp's own crematorium, depending of their status as prisoners of war these victims were buried on that basis in mass graves at the city limits of Bergedorfs. The 348 survivors were transferred in May 1942 into the Sachsenhausen concentration camp and there probably murdered immediately after their arrival. The combination of social Darwinian and racial biological ideology, showed up in the 1941-42 country-wide in the Reich and carried out in all concentration camps under Action 14f13, which aimed to 'eliminate' individuals that are or were not any longer working-capable. Since the camp was due to a typhus epidemic in the period from December 28, 1941 to March 31, 1942, under quarantine, the camp was left fending by itself, as entry from the outside was prohibited. Within the camp during this period prevailed a catastrophic drug shortage, according to the death registry entries, 763 prisoners died. The SS Medical Commission travelled not until April 1942 to Neuengamme. Among the 300 selectees included not only the sick and debilitated, but also political dissidents and about 80 Jews. As the 'Ambulance Services' records indicate, these prisoners were shortly afterwards taken to the 'Country-Mental hospital'(Landes-Heil-und Pflegeanstalt) Bernburg and murdered after their arrival with poison gas. Fearing selection, many prisoners avoided reporting their ailments to the infirmary. Numerous prisoners due to the miserable working conditions and poor malnutrition had gastric intestinal problems, Tbc or suffered heart diseases, often had physical pain from, or had work accidents, the area in front of the Revier was nevertheless always crowded. Although the Prison Orderlies struggled for all they could, they lacked any effective aid for the hygienic conditions, drugs and trained staff. Until 1942, it was prisoners who were doctors by profession or who possessed a medical training, were forbidden to work in the infirmary. Temporarily the SS prison tightened admissions (for unknown reasons), according to Jewish prisoners they and inmates from the penal company, Jehovah witnesses were banned from entering the infirmary as well as other groups, thus medical treatment of these people was entirely lacking. The Neuengamme Concentration Camp and subsidiary camps included 106,000 prisoners, 9.1 percent were Germans. The largest national group consisted of Russians 18.7%, Poles 16.7%, French 11.4%, Ukrainians 10.4%, Dutch6.9%, Belgians and Danes 4.75% each, and Latvians 4.1%. The data is based primarily on an analysis of death certificates that had been issued by the Neuengamme concentration camp registry office. They are also based on the death records preserved from the camp infirmary, between May 1, and May 15, 1945. Both sources are incomplete and include several deficiencies. Until the autumn 1944, with regard to the main camp these sources can be considered relatively complete. Because of the considerable number of subsidiary camps, more than 80 of them by 1944/45, these subsidiary camps included three times as many prisoners as the main camp (Stammlager) as well as the more than 10,000 people who died during the evacuation, the names (16,956) recorded by both sources represent only one third of all prisoners who died at the Neuengamme concentration camp. As an additional control in the organization of any camp operation, the SS established a 'prisoner self-government', which leaned towards both traditional forms of a prison system as well as to military structures normally applied. [All concentration camps had appropriate manuals]. Camp-. Block-, and Room Seniors were responsible for the free flow of camp life reporting to the SS. For the work details Kapos and Foremen were used, which would support the oversight of functions to assist the guards. By the betterment of these appointments, the SS, tried to sow discord and jealousy among the prisoners, hoping to have willing tools in them. The influence of these 'function detainees' were considerable, and depending on the personality they could use them for the benefit or detriment of other prisoners. Quite a few of them tried the options available not only for their own survival, but also - albeit often limited to members of their own group - some of them fully used their position to assist in building a resistance network in the camps. On the other hand others were willing to participate as willing tools of the SS. They became ruthless henchmen of the system, so that the SS could achieve their objectives with inmate self-government, at least partially. A big part of the 'dignitaries'(Lagerprominenz) were housed in Block 1 (later Block 5), which clearly stood out due to a lower occupancy and better sanitary conditions than other prisoner accommodations. The SS billeted there prisoners who held higher functions and those for practical activities in the SS camp and the ones as clerks in their offices . This block (barrack) where every prisoner until the war ended, had each a bed and a locker for himself. The amenities for prisoners was demonstrated as a show piece to civilian officials while visiting the camp. The President of the Hanseatic Higher Regional Court reported in September 1941 on a 'very in-depth tour of the Neuengamme concentration camp', and in the subsequent 'free debate with the leader of the camp' had cleared 'some misunderstandings that had come to his notice. For the vast majority of prisoners in the concentration camp Neuengamme, the accommodation conditions represented were entirely different. In the first years the prisoners were lying on straw mattresses on the floor. [This is nothing unusual]. 1942/43 the barracks were equipped with three-tier bed frames. Up to the end of the war, the condition worsened due to the high admission figures more and more, so that finally, two or sometimes three prisoners had to share a bunk. Overcrowding led to disastrous sanitary conditions. Bugs and diseases spread out in the barracks like wild-fire.